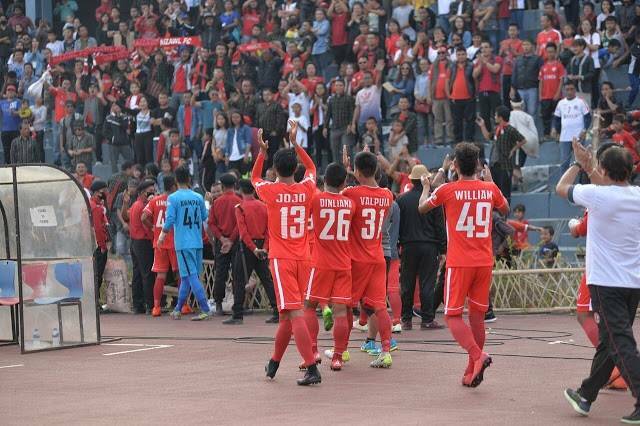 Two goals from Leonce Dodoz and a strike from Lalkhawpuiamawia saw Aizawl FC beat Gokulam Kerala FC 3-2 at the Rajiv Gandhi Stadium on Friday as the Aizawl side wrapped up their I league season in style. Aizawl FC has found a potent attacking combination in their forward line with Dodoz and Puiamawaia as the attacking duo kept Gokulam FC on their toes testing the Kerala defense. After absorbing the early pressure giant killers Kerala made their presence felt as Rashid launched a stinging volley on the 19th minute that forced Lalawmpuia to a diving save to his left. Gokulam Kerala FC found a break into the game as they were awarded a penalty on the 24th minute as Henry Kissaka’s shot found Kim Kima’s outstretched hands and the referee straight away pointed to the spot. Mahmoud Al-Ajmi stepped up for the spot kick to give Gokulam a 1-0 lead. Aizawl FC tried to get back into the game but Kerala FC managed to see through the first half with a 1-0 lead. The second half saw Santosh Kashyap’s side piled up the pressure on Gokulam defense and Aizawl FC finally broke Gokulam defense as Dodoz scored from a goalmouth melee within the crowd of Gokulam defenders from Albert’s cut back to restore parity at 1-1 at 59′. Charged by the equalizer Aizawl FC found their feet as Leonce Dodoz scored a brilliant solo goal in the 74th minute to put Aizawl 2-1 ahead. The brilliant move saw Ionescu released Dodoz on the left flank from a counter-attack as Gokulam committed men forward in search of an equalizer.Dodoz with space darted down the left flank into the box skipped past his marker and finished from a tight angle on the left to make it 2-1. Aizawl didn’t take long to make it 3-1 through Mawpuia’s strike on the 78th minute as the striker rattled the net with a volley that came from Gokulam’s goalkeepers Bilal’s fisted clearance inside the box. With the 3-1 win, Aizawl FC presented their fans a perfect parting gift as the state celebrates Chapchar Kut festival to round off their I league campaign with 24 points as the defending champions head off to Guwahati to for their AFC Cup campaign against ISL giants Bengaluru FC on 7th March 2018.